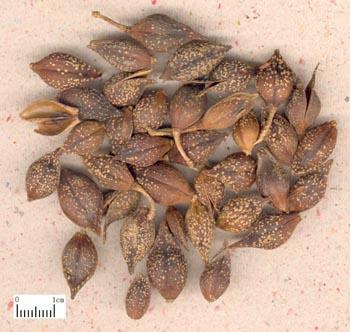 The fruits of Forsythia suspensa (Thunb. ) Vahl. of family Caprifoliaceae. Shanxi, Shaanxi, Henan provinces, etc. of China. The fruit is collected when it begins to ripen in autumn and then processed, it is called Qing Qiao and considered as the better; and the fruit collected when it is fully ripe before Cold Dew (the 17th solar term) and being yellow in color. 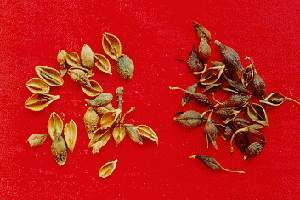 After it is dried, it is called Lao Qiao or Huang Qiao. Slightly fragrant smell and bitter taste. The good Qing Qiao is marked by green in color, being indehiscent without branch or stem; the good Huang Qiao is yellow in color, big and thick shell without seeds. Bitter, slightly pungent, cold; lung, heart and small intestine meridians entered. Clear heat and remove toxicity, disperse wind-heat, clear heart-heat. It has a similar action to that of Jin Yin Hua, and also can disperse wind-heat exteriorly, and clear heat and removes toxicity interiorly. So it is commonly indicated for many syndromes of warm diseases in stage of defense, qi, nutrient and blood systems, and often combined with Jin Yin Hua for mutual reinforcement. Here are some examples: Yin Qiao San from Wen Bing Tiao Bian is mainly indicated for syndrome of defense system; Qing Ying Tang from Wen Bing Tiao Bian is mainly indicated for syndrome of nutrient system; Shen Xi Dan from Wen Re Jing Wei is mainly indicated for syndrome of blood system. Although its mild dispersing action is slightly inferior to that of Jin Yin Hua, the property of bitter descending and cold-clearing is much powerful, it excels in clearing heart-fire and is often used in treating invasion of pericardium by heat which is manifested as high fever, restlessness and coma. In Qing Gong Tang from Wen Bing Tiao Bian, it is combined with Xuan Shen, Lian Zi Xin, Dan Zhu Ye and Huang Lian which are all good at clearing heart-heat. For external contraction of wind-heat, it is often combined with exterior-releasing herbs, such as Jin Yin Hua, Bo He and Jing Jie, etc. With the action of clearing heat and removing toxicity, it can also take effects of curing sores, relieving swelling and alleviating sore throat. Its action of relieving swelling and dissipating nodulation is much better than that of Jin Yin Hua, so it is the essential herb for treating sores and abscess due to heat-toxicity and is honored as "holy medicine for patients with frequent ulcer"; by predecessor. For sores with swelling, it is often combined with Jin Yin Hua for mutual reinforcement, and also combined with toxicity-removing and abscess-curing herbs frequently, such as Pu Gong Ying and Zi Hua Di Ding. For swollen and sore throat, it can be combined with toxicity-removing and sore throat-alleviating herbs, for example, Niu Bang Zi and Ban Lan Gen, etc. Since it has actions of removing toxicity and dissipating nodulation, it can also he used to treat scrofula and subcutaneous nodule due to phlegm-fire accumulation, and often combined with phlegm-eliminating and nodulation-dissipating herbs, such as Zhe Bei Mu and Mu Li, etc. In addition, it can clear fire from small intestine, and also be indicated for heat stranguria, scanty dark urine with difficulty and burning pain in micturition; it is often combined with stranguria-relieving diuretic herbs.